Do you love decorating Easter Eggs? Then this class is for you! We’ll use our egg-straordinary new Easter Egg Decorating Kit to create Easter Egg Masterpieces. $20 per child includes an Egg Decorating Kit. Suitable for ages 8-13.
special tools we partnered with American Girl® to create. 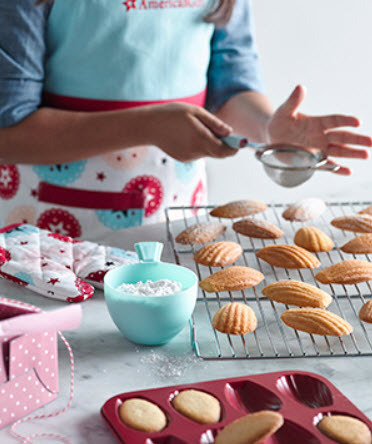 We’ll use a fluted plaque to bake the golden, shell-shaped cakelets, then use the sifter to sprinkle them with powdered sugar after they’ve cooled. Arrange them in tissue-lined boxes decorated with colorful twine and stickers to surprise your friends with homemade treats. $30 per child includes an American Girl® Madeleine Set. Suitable for ages 8-13. Call 602-957-0430 for class times and more information.